A 2 Cell LiFe battery produces 6.6 volts nominal, which is almost a full volt less than a 2 Cell LiPo battery. The LiFe battery is not meant to replace the performance of a Li-Po battery, it is simply another option. 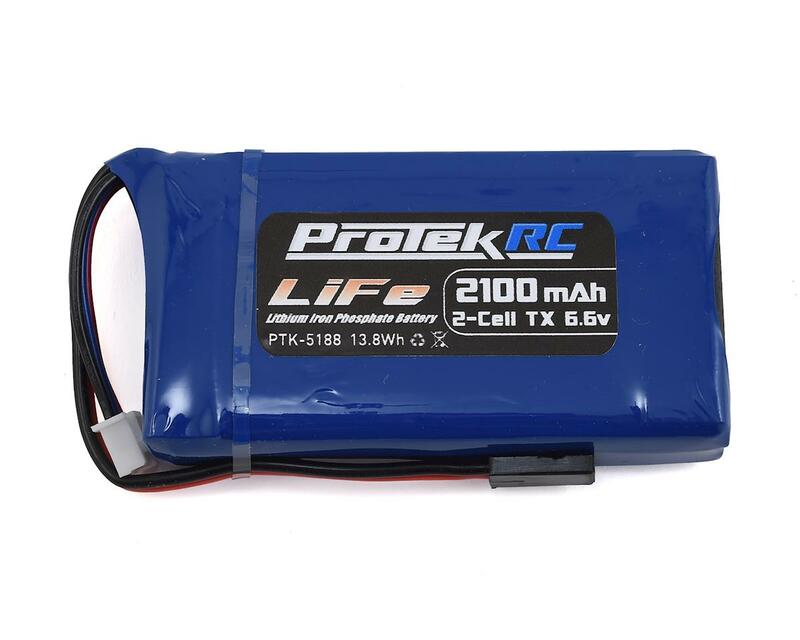 LiFe offers the user a battery with a good discharge curve that is better than that of a NiMH battery, but without the risk of damage or fire that exists when a LiPo battery is abused. 2) You must not discharge the LiFe battery pack below 33% capacity during the break in period or below 2.5V per cell after break in. 3) It is not recommended that you charge this LiFe battery pack at amp rates higher than 1C. 4) Read the instructions carefully before operating this battery. Virtually no "self discharge", so the battery is always ready to go even weeks after charging. Superior voltage performance under load compared to NiMH cells, with consistent torque and speed. Got one for my futaba 4px has worked great so far have used it for 6 hours straight and hasn't moved between 6.5 and 6.4 im new to this type of battery and almost sent it back. After i charged it to 7.2v i unplugged it and voltage dropped to 7.1 then 7.0v i put it in my radio set the battery option for the life battery in my radio. And noticed the voltage kept dropping. I looked around on the net didn't notice much info about this. The voltage dropped down to 6.5v after about 5 minutes. I contacted amain tech and was told this is normal and it will take along time before it drops Again and it was doing what its supposed to do stabilize around the 6.6v level and that 6.5 to 6.4 is normal. its just the chemistry of the Life battery. So far im very happy have got alot of hours on the radio over 5 hours of just goofing in options along with 6 hours of run time running my car and its still at 6.5 to 6.4v great battery Im happy with my purchase. 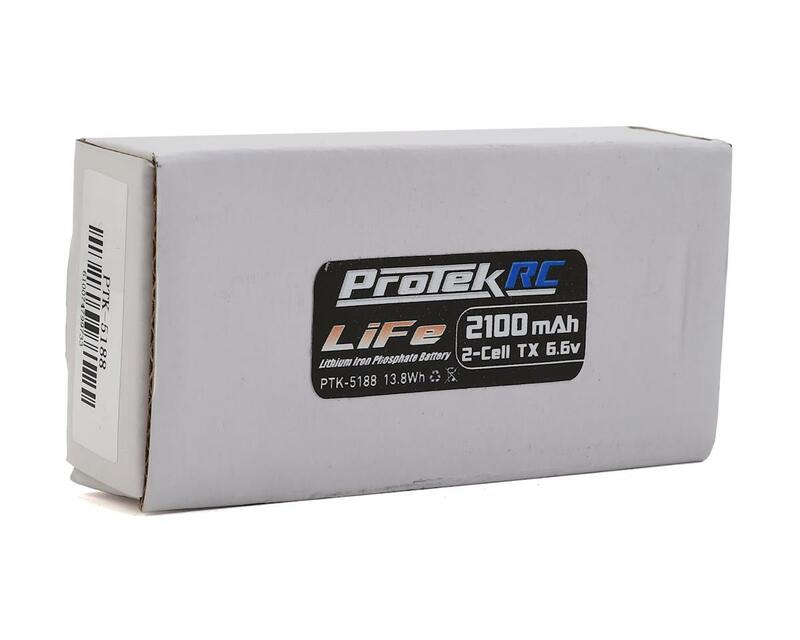 If you are looking for a good battery for your 4pk then look no further! For a weekend racer like me you might only have to charge this thing 1 or 2 times a season. I put almost 10 hours on my transmitter before charging it and only put 850mah back in. Great battery and great price! This battery has worked great for me. It lasts a very long time in my Futaba 4PX. I also want to note that this fits inside a Futaba 3PV as well. If you have a 4pk or 4pkS and your in a grueling mains this is the battery you need!! makes ur radio 15% lighter and it will last 50% longer!! Ordered one up with my 7px and it's perfect. Better than expected... seems t2o last longer with every charge. So much better than using AA batteries.. Awesome battery, had zero issues with it so far after about 3 months of use. A lot better than spending so much money on AAs all the time that go bad so fast, this just needs to be recharged. I usually get a few race days on it before i need to recharge it. But once it starts going dead the voltage drops off very quick and will become useless until charged again. Works great. Lasts long. Fits in the radio perfectly and it's lighter than the stock NiMh pack. I can't believe this battery has 5 stars, I bought one and 3 weeks later one cell went bad, they replaced with a new one and it happened same 2 moths later, I will never buy this battery again, Very disappointed. I have this battery in all of my Futaba radios. The piece of mind and eliminating another variable is well worth double this price. Perfect battery for your 4PKS much lighter then stock and last many hours between chargers.